Representing established and emerging regional artists. We all reach for smart phone cameras to document the drama of sunsets and poetic landscapes, but the photographic lens tends to preserve either a single highlight or a general expanse of diluted drama. 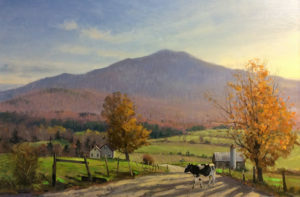 By contrast, the fully nuanced visual and emotional impact of New England landscapes are masterfully recorded in the oil paintings of Southbury, Conn., artist Thomas Adkins. 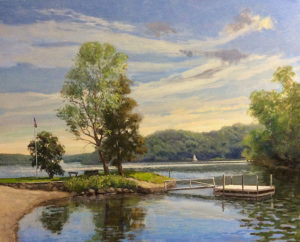 When encountering spring brightening a Connecticut lake, Adkins notes the carefree clouds amid soft, friendly blues, pays attention to the shifting tones of the water, and ties it all together with a flourish of yellow daffodils along the shore. 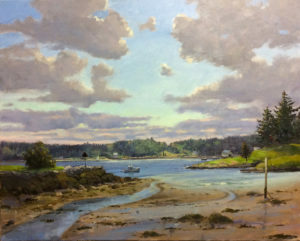 A Cape Cod tidal river is a symphony of colors in another painting, and yet Adkins manages to convey the absolute stillness of the morning. These scenes and many others are included in an upcoming exhibit at the Gregory James Gallery of new paintings from some of the artist’s favorite places—the Litchfield Hills, northern Vermont, the Midcoast of Maine, Monhegan Island, and Cape Cod. The exhibit opens Oct. 27 and continues through Dec. 31. An opening reception is scheduled for 5 to 7 p.m. Oct. 27. The comments point to Adkins’ devotion to capturing a sense of place. He does it so well that his long list of awards and honors include first place in Lyme Art Association’s 2016 New England Landscape Invitational, the People’s Choice Award in the association’s New England Landscape 2017 exhibit, and the 2015 People’s Choice Award from the prestigious New Britain Museum Of American Art, where he has a painting in the permanent collection. additional studies, and memory impressions all playing roles in the final compositions. Painting excursions for the new works in the exhibit took Adkins all over New England. Last March, for example, he spent a week painting with a group of more than 20 artists, including artists from Europe and Russia, in the Stowe/Jeffersonville area of Vermont. Every year, Adkins spends at least a week painting on Monhegan Island off the coast of Maine. “We go out there and work seven days, morning to dusk,” he said. A graduate of Paier College of Art of New Haven, who also completed graduate classes at the School of Visual Arts of New York, Adkins has worked as art director and creative director for some of Connecticut’s and New York’s most prestigious advertising agencies. Adkins’ designs and illustrations have been used by Black & Decker, Kraft Foods, GE, IBM, Minolta, Nestlé Waters North America, Wendy’s and other major corporations. For more information on the exhibit, call the Gregory James Gallery at (860) 354-3436.